You’ve seen the R-Rated hit ‘Deadpool’ movie staring Ryan Reynolds. Now, read one of the essential comics that made Deadpool the success he is. Little insight: Deadpool has a healing factor, so when Deadpool loses a limb, he doesn’t think anything of it; he’ll regrow the parts. Someone’s been collecting up the lost parts and making their own, evil(er) Deadpool. You meet him here. 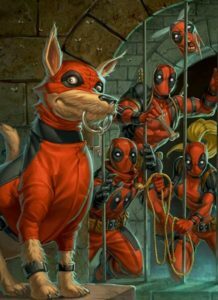 This collection of 5 issues has every Deadpool you could imagine, and some plot to stitch the whole thing together. Enjoy.